Tim Vail became a record equalling 6 time National Racketball Champion after an astonishing 112 minutes as he came back from 2-0 down against Mark Fuller to win 3-2. Fuller will be having nightmares over the 3rd game for a long time after taking an 8-3 lead only for Vail to slowly claw it back to get game ball at 10-8, Fuller took the next two points to take it into a tie break but Vails patience won and he took that 12-10 to stay in the match. From then on Vails experience and patience were key as the rallies became longer and he ground Fuller down to etch his name on the Ian Wright Memorial Trophy for the 6th time. Natalie Lawrence etches her name on the Women’s trophy as she claimed her first National Racketball title with a 3-1 victory over defending champ Claire Walker. Lawrence took a close first 12-10 only for Walker to come back to take the second 11-6 but Lawrence was determined and played her way back into control as she took the next 2 games to clinch the title. The O35’s saw James Bowden defeat defending champ Andy Corben with a convincing 3-0 score line whilst Zoe Melis also stopped Sarah Taylor from retaining her title as she dominated their group. Ian Cox claimed O40’s glory as he defeated top seed Mike Harris in the semi-finals before taking on David Lord in a final which swung both ways which Cox claimed 11-6 in the fifth. Claire Walker retained her Women’s O40 title with a victory over Sam Mueller, as did Andrew Murray in the O45’s as he defeated Pete Goodings 3-1. Rachel Woolford took O50 glory as she took out the number 2 seed with a 3-2 win before defeating Amanda Harding with the same score line in the final, Neil Baldwin claimed the MO50 trophy by beating Stephen Wall 12/10 in the fifth after 62 minutes! 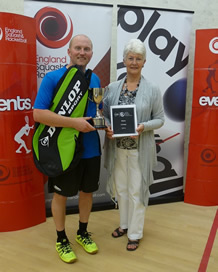 Mike Phillips claimed the MO55 trophy after a convincing 3-0 win over Nigel Millington and Lesley Sturgess made up for last year’s final disappointment with a perfect run of 3-0 victories in her group to take the O55 title. Club Coach Rob Shay took O60 glory after defeating surprise finalist Roger Monteil 3-1 who had a tremendous tournament coming through unseeded. 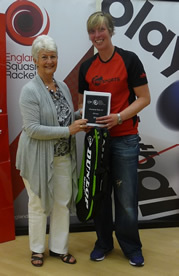 Linda Smith won the Women’s O60 crown by defeating favourite Bett Dryhurst 3-2 in the final, Dryhurst has consolation in the WO65 title she won to make it her 28th National Racketball title. The MO65 defending champ David Scurlock retained his title with a comprehensive 3-0 victory over Graham Sayer and Bev Pegg defeated defending O70 champ Rod Embley 3-2 after an amazing 56 minutes.